I will start by admitting that I am a total geek, an unashamed nerd. It’s no secret that I love the radio and that I love sports, combining those two results in my fondness for 1500 ESPN – Twin Cities. What may not be known as well is my absolute fandom for Garage Logic on 1500. GL isn’t an easy concept to explain. Host Joe Soucheray has created a town, the town of Garage Logic, and has been appointed mayor of said town. If it seems crazy, it is a little bit, but that’s one of the many reasons I love it so much. Soucheray is the ‘speed bumb’ right in the middle of the day on 1500, speaking minimally on sports topics. I’d say that would be left for SportsTalk with Soucheray and Patrick Reusse, but they don’t really talk about sports during that hour either. On Soucheray’s Garage Logic, there is a recurring segment called a ‘ray of hope’. Soucheray, his loving producers Rookie and Reuvers, newsman John Heidt and the listeners search for something positive in this sometimes dreary world. I offered a ray of hope of my own on Friday afternoon via email. 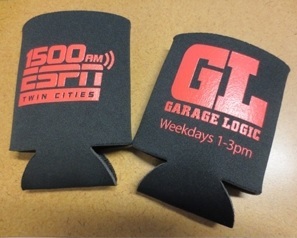 I illustrated that I had purchased a GL can koozie from the 1500 ESPN Prize Vault and that I had received an email from the station saying it was on my way to my doorstep via USPS, the United States Postal Service. I brought up the USPS as the ray of hope, knowing Sooch is such a lover and friend of the Post Office. To my surprise it led the show on Friday afternoon and my email was the topic of conversation for the first whole segment. Actually, it was Joe’s amazement that the can koozie cost me so many points, but still for a radio geek it was quite a thrill to hear my favorite radio host say my name multiple times over the airwaves. In Soucheray’s discovery of the cost being too high for a koozie, he offered that I send back my can koozie and he’ll sign it for me. Let me tell you, the can koozie will be on its way back to the Cities. Having your name on the airwaves isn’t a huge deal, I’ve said my own name over the airwaves hundreds of times, but there’s something cool about your favorite anything acknowledging that you exist in any capacity whatsoever. My love of sports has brought me a lot of things, but little did I expect it would bring me a radio show that has nothing to do with sports and that I’d fall in love with it. I believe you should always thank the people who make your day better, so a big ‘thank you’ for making every day better, Rookie, Reuvers, Heidt, Kenny and, of course, Joe. You can check out Friday’s episode via iTunes here.